FABULOUS Zip Front Top by EXOFFICIO! Textured Fabric. Attached Hood. Top to bottom(from shoulder to hem): 24". Zip Front. Chest: 18". M14-404 -- Techspressa; L. - cotton blend, UPF 50. 27" length. - thumb slits. - long sleeves. ExOfficio Women's Sol Cool Performance Print Hoody - New! Drirelease Tencel®fabric:• Poly and Tencel fibers are blended at the yarn level so that technical properties cannot be washed out. • Fabric blend creates a lightweight knit with soft, next-to-skin comfort. Great condition. Two front pockets and a drawstring hoodie. No returns. It repels mosquitoes (including those carrying West Nile virus and malaria), ticks, ants, flies, chiggers and midges (no-see-ums). Insect Shield repellent lasts 70 washings. Do not dry clean. Main materials: 70% Polyester 30% Cotton. ExOfficio full zip hoodie. Colors are gray, purple, and black, has a wrapped bandage look and texture. Black decorative stitching along seams. Very good pre-owned condition, no flaws. Kangaroo pocket. Two front zipper and one inside zipper pockets. Half zip pullover. Two front zippers. Chest is 21.5" across from underarm to underarm. Length is 26". Sleeves are 31" from back middle of neck to end of sleeves. Item Condition: 2.5 out of 5. Sweater has one very small hole on the back and a few loose threads on the sleeves but the wear is pretty minor and overall sweater is still in good shape. Type: Full zip hoodie. It repels mosquitoes (including those carrying West Nile virus and malaria), ticks, ants, flies, chiggers and midges (no-see-ums). Insect Shield repellent lasts 70 washings. Do not dry clean. Center back length: 26in. Chest (armpit to armpit): 20". length down the center back ,from the collar seam to the bottom hem is 28". Sleeve:24.5". Size Small. Care instructions: Machine wash cold with like colors. Use only non-chlorine bleach when needed. Tumble dry low, cool iron if needed. Size: small. • Length: 22”-25”. Weight: 0 lb 11 oz. 70% OFF! NEW EXOFFICIO FLORIANA CONVERTIBLE CARDIGAN , SIZE SMALL, MARINA. Travel in style with the Floriana Convertible Cardigan. This wool blend sweater will keep you cozy wherever you roam. The removable scarf buttons around the collar and has a hood for versatile warmth. 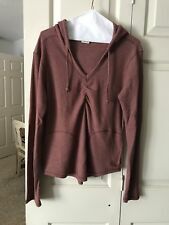 Hoodie is in a excellent lightly used condition-LOOKS LIKE NEW- Size:XL. shoulder to hem:29". 2T28-201 -- Blue; Size XS. Machine wash. 25" length. long sleeves. Length- " 25.5 " from center base of collar to bottom of sweatshirt. Note that most of my inventory is pre-owned clothing. Arms - " 30 " from center base of collar to end of cuff.